Starting off your meal with a broth-based vegetable soup is a way to make your meal more filling without adding a lot of calories because these soups tend to be low in energy density, or calories per gram. Try a soup made with Japanese noodles, called udon, to add variety to your meals. A soup made with homemade chicken broth, udon noodles, radishes, scallions and Chinese cabbage contains about 94 calories per 1-cup serving. You can make a quick version by mixing the noodles with vegetable soup, vegetable broth, broccoli, tofu, soy sauce and sesame oil, resulting in a soup with about 204 calories per serving. These soups have between 1/2 ounce and 1 ounce of noodles per person. Soups that have a larger portion of noodles are higher in calories and are thus better suited for a meal than a starter. 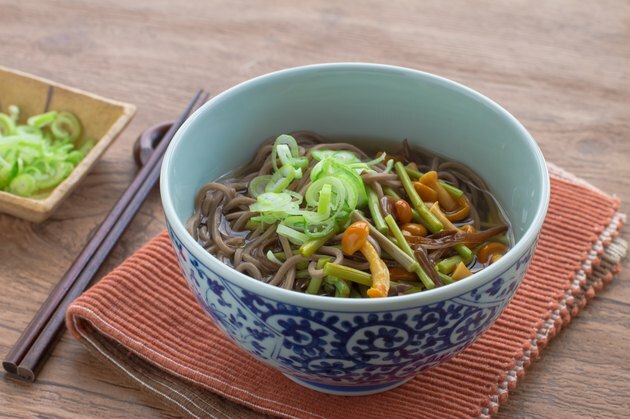 One version with about 341 calories per serving contains kale, mushrooms and onions in addition to broth and 2 ounces of udon noodles per serving. A large serving of another vegetable udon soup with 3 ounces per person of udon noodles along with mushrooms, tofu, carrots, scallions and bok choy has about 540 calories.